If your day involves walking or standing for long hours, then your feet more often than not, feel like fire blades. In today’s tough economy, you do not have time to keep going to a spa for a treatment. When you get home, it is possible to get your feet massaged by a great foot massager. You can easily improve the health of your feet and relax them after a long day by massaging them. This is perfect if you love your job and wouldn’t think about quitting but still want to ensure that your feet can support your weight comfortably. When used correctly, this machine can help encourage blood circulation to your limbs. 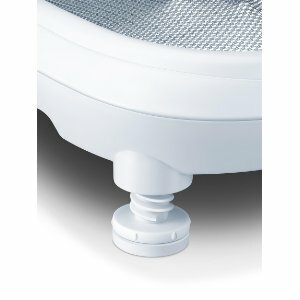 If you work at an office and do not move as frequently, this Beurer foot massager will help you work around that. This Beurer foot massager review tells you all you need to know about this product and why it is a good buy. Beurer is a company that has focused its products and services on the health and well-being of its customers. If you are looking for a company that has been in the industry for years, Beurer is the one for you. With over 95 years of experience in the industry, the company has figured out what works and what doesn’t. They know what customers need to get the most out of the massage machines they buy. Their experience guarantees you that you will be getting the best foot massagers on the market. The company also produces baby and body product. They have worked hard to understand what their consumers need and have provided the best quality to them. 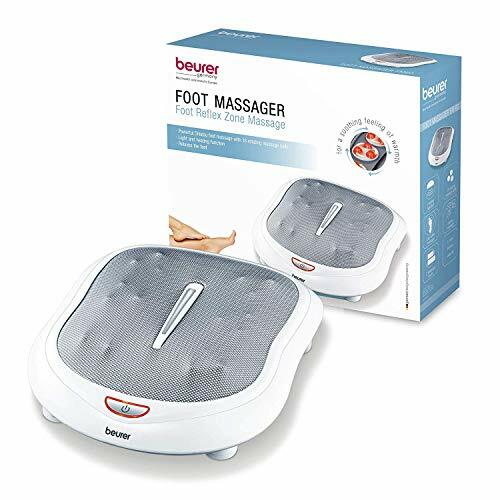 Buying the Beurer FM 60 Shiatsu foot massager guarantees you that you are getting the best quality there is. You are also certain that it will be durable and last you for years. They provide you with functionality and quality at an affordable price. In many cases, it is difficult to find foot massagers with wide selections when it comes to settings. This one, however, gives you many options to choose from. You can either decide to growth light or deep massages. You can choose the intensity of the massage you want without necessarily having to go out or buy another massager. This massager offers you a heat function. You are able to choose a hot foot massage. You also have the option of choosing just how hot you want the massager to be when you use it. Heat function is very helpful in foot massagers. It promotes blood circulation, which in turn helps loosen your muscles. It also helps make the massage process more pleasant and satisfying. You can also choose to have the massage with the heat feature off, and you will still love the experience. The massager comes with 9 shiatsu balls for each foot. Depending on the settings you choose, these balls will produce deep or light vibrations that will offer the massaging effect on your feet. There are settings that allow you to choose whether you want deep or light massaging. The intensity will vary from person to person and how tired your feet feel. This foot massager gives you the option of choosing between two massaging speeds. This will depend on whether you want the vibrations to be fast or slow. The speed also has an effect on how the massager will work on your feet. Most people feel comfortable with slow deep massage on their feet. When you want a foot massage, the last thing you want is for your foot massage to take forever to heat up. Not only will this be inconvenienced, but it may also make you feel bored every time you think about activating it. This foot massager heats up very quickly allowing you to begin your massage quickly. You can also switch the heat on and off during your massage easily and faster. It is very inconvenient to have a foot massager that takes up too much storage space. You end up wishing it was smaller or wishing you had bought another massager. Well, this Beurer Foot massager is perfect for people who are short on space. The electric cable goes under the device and makes it easier to store. You will therefore not have to worry about not having enough space to store the massager. If you are worried that your feet are too big or slightly smaller than most average feet, you no longer have to. This machine accommodates all feet. You will therefore not have to worry about not getting the most out of it because your feet are not average. This means that this massager is suitable for both men and women. It also means that you can use it with someone else who has smaller or bigger feet that yours comfortably. This foot massager gives you more value for your money by allowing you to get many features and at a very affordable price. You can use it for many years without having to worry that it is made from cheap quality materials. Using this massager does not require any technological know-how. Once you have plugged in the switch, the adjustments are straightforward and easy to find. We love this product because it is made from very high-quality materials. This allows you to use it easily without worrying that it will break down at any time. It is also easy to use. There are many things to consider when choosing the right foot massager. The more setting options, the better and more flexible it is to use. You also need to ensure that the massager can fit your feet and your budget. This foot massager is great and allows you to get more value for your money. Hope our Beurer foot massager review helps to decide yours.